There will be a rocking event on coming this Thursday called Night Bazaar by Folkways. Night Bazaar is an event highlighting the community with a full spectrum of unique experiences, food, music, art and performances. Night Bazaar is created by community building organization and creators of the Red River Market, Folkways, who transform the Broadway Garage each month into a whimsical evening of live entertainment and shopping. It looks like the evening bazaars of Southeast Asia which visitors can shop for trinkets and handmade goods from local artisans along with live musical performances by Travis Naegle, Fancy That, Pat Lenertz, Travis Atwood and the Ric Todd Band. Enjoy street food from the food trucks and drinks from Front Street Taproom, Flannel Fizz, Scoop and Dough Co, The Dogfather, Indulgence Baking Co, Crunchy Dog, Deb’s Corner Foods and Catering, and Texas Q. You can take part in a selection of curated experiences. 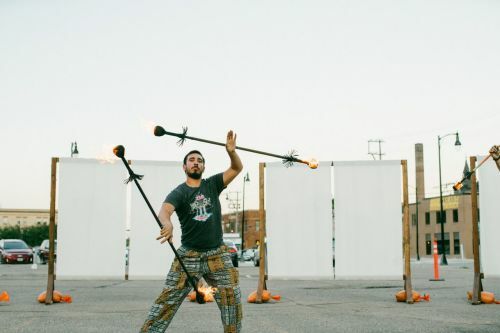 Live music performances, live street art demonstrations by four local artists, circus entertainment and photo-booth by Katirose start from 5:00 pm to 9:00 pm. There will be experiences such as a henna tattoo, a personalized poems, face painting, tarot card readings by Intuitive Readings, aura photos with Crystal Rock Healing, attend drawing sessions with Draw Club, build your own necklace or bracelet with Designs by Elise Marie and Making essential oil sprays and rollers with Make Room. For the tarot card reading, Ravn Thor, Intuitive reader, will do three card tarot readings at the bazaar. Ravn has over 10 years of experience after apprenticing with local reader, Bonnie Bee. Live graffiti demonstrations will be done throughout the evening by four street artists along with creating a live art piece, street artist, Hideuhs, creator of three murals at the Broadway Garage, will host Draw Club. Draw Club is a great opportunity for visitors to express their creativity and draw together. No drawing experience is needed and aerialist circus performer, KatiRose, will demonstrate and teach the basics of her craft on a variety of contraptions including a swing and lyra hoop. Visitors will be able to pose for a circus themed photo at her photo booth. To enjoy shopping for trinkets and handmade goods, there will be multiple of artists and markers at the Bazaar market: Soul to Bone, Nickel’s Bike Shop, Dark & Collaboratives, Lost in Fargo, Aerow, Little Miss Squishy, Designs by Elise Marie, Gnome Nook, Ukrainian Folk Art- Egg Reading by Cayley, Rockgirl Studio, J.Rose.Designs, Crystal Rock Healing Mini Rock Shop, DogIDs(event co-sponsor). Visitors can experience and enjoy all the fun at the Night Bazaar by Folkways. This event is free, family friendly and dog friendly. Night Bazaar is a monthly summer event. The next Night Bazaars are scheduled for Thursday, September 27th and Thursday, October 25th. Folkways also hosts the Red River Market every Saturday until the end of October from 10:00 am to 2:00 pm at Broadway Garage and will also be hosting a Canoe Parade later this fall. Thursday, 5 p.m. to 9 p.m.